Niagara Falls is home to a number of fantastic dining destinations that offer amazing food and wine for couples, families, and people of all ages. From Fallsview fine-dining to casual food on the go, Niagara Falls has something wonderful for everyone to enjoy. 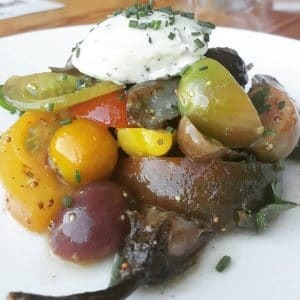 Niagara Heirloom Tomatoes with this salad of roasted baby eggplant and herbed mascarpone. Windows by Jamie Kennedy Fresh Grill & Wine Bar offers some of Niagara’s best Fallsview dining with an extensive seasonal menu that currently features dishes like J.K. Short Rib Poutine, Rainbow Trout, Cumbrae Pork Rack Chop, and Ontario Lamb Shank featuring delicious Niagara Brewing Company beer braised lamb. Enjoy these fresh and innovative dishes in direct view of the breathtaking Niagara Falls through the dining room’s floor to ceiling windows and get ready for a Niagara Falls dining experience unlike any other. For modern and delicious Italian dishes served in a stunning atmosphere in direct view of Niagara Falls, visit the Rainbow Room by Massimo Capra inside the Crowne Plaza Fallsview hotel. The restaurant’s seasonal menu will give you a true taste of Italy right here in Niagara Falls with dishes like Milli-Strato Lasagna made with 87 layers of hand rolled pasta, Sweet Potato Cannelloni prepared with Ontario goat cheese, and Maple Mustard Crusted Ontario Lamb Rack. And with the Rainbow Room’s extensive wine list you can pair your meal with the perfect glass of wine from award-winning Niagara wineries and beyond. With live action food stations and an unbeatable view of Niagara Falls, the Fallsview Buffet Restaurant is the place to go to find a vast array of amazing food for breakfast, lunch, and dinner. The Fallsview Buffet is a great dining destination for people of all ages and offers a wonderful dining experience that’s both interactive and delicious. The Terrace Food Court, conveniently located in the Casino Niagara Atrium between the Crowne Plaza Fallsview and Hard Rock Cafe, is the perfect place to find quick and tasty food at Pizza Hut, Kentucky Fried Chicken, The Great Canadian Burger Company, and Subway. There’s no better place to stop for food during a busy day of sightseeing, and with a number of different choices, there’s sure to be something for everyone to enjoy. The newly-opened Morton’s Grille is Fallsview dining at its finest, offering a unique steakhouse experience that combines high-quality ingredients with a relaxed and elegant atmosphere. This beautiful Fallsview restaurant is located inside the Marriott Fallsview Hotel & Spa and features delicious menu items like AAA Canadian Beef Steak, Blackened Mahi Mahi, Double Stacked “Ravenous Style” Burger, and Morton’s Midwest Prime Beef Steak. For an incredible lunch and dinner experience in direct view of the thundering Niagara Falls, make sure to visit the Milestones on the Falls restaurant inside the Marriott on the Falls hotel, where you’ll find amazing food and wine in an unforgettable atmosphere. 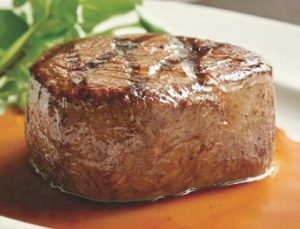 Indulge in dishes like Butternut Squash Ravioli, Brie and Mushroom Burger, Stacked Chicken Parmesan, Slow Roasted Prime Rib. And don’t forget to try the Milestones Original Bellini, White Chocolate Cheesecake, and other great items on the bar and dessert menus.